Magnetic bases vs. the Boxcar Base – which is better for letterpress? This is a magnetic base, a type of letterpress base. Lesson one. You’ll find two main types of magnetic bases out there. Bases with a surface magnet (like the Patmag): these bases have with a magnetic strip adhered to the top of an aluminum base. They’re the least expensive magnetic base option and there are some drawbacks. The magnetic strip gives under pressure, making it difficult to get crisp, deep-impression printing. 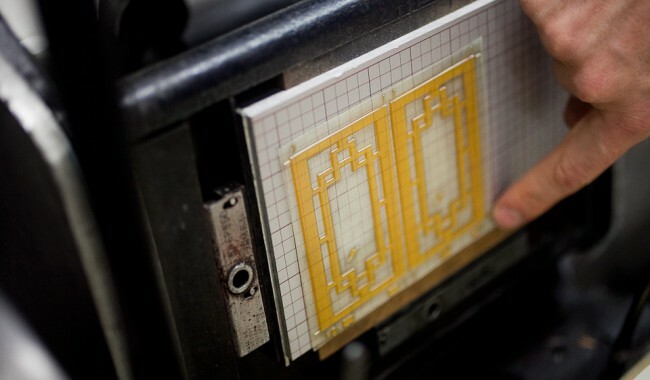 In addition, the magnetic strip often isn’t strong enough to hold steel-backed plates, so printers can experience “plate drift”—their plate nudges out of register during the course of a press run. Printers may need to resort to spray adhesive and scotch tape to keep their plates in place. After a run is complete, to remove the adhesive and scotch tape from the base, you’ll need solvents and hard scrubbing, which unfortunately destroys the base’s flat surface. Once the base’s surface becomes pitted and uneven from tape and adhesive use, the base becomes more difficult to use; its uneven surface leads to poor inking and poorer impression. Bases with inlaid magnets (like the Bunting): the inlaid magnet bases are embedded with stronger magnets, so plate drift is less of an issue (though printers who use cylinder presses report that, when printing large solid areas with these bases, their plates can still creep out of register.) This is the most expensive letterpress base option: more than $600 for an 8″ x 11″ base. Because of the base’s extreme attraction to its steel-backed plates, registration is challenging, and small adjustments of a plate are nearly impossible. (Imagine you’re made out of metal, and you’re attached to a very strong magnet, and you want to move 1/8” to the right. Well, you can’t, because of the strong magnetic pull. You’ll end up not moving or moving an inch or two inches instead.) When placing plates on the magnetic surface of these bases, the draw of the magnet can trap and pinch fingers. To remove the plates, often an ink knife must be used to lever under the plates and release the magnetic pull. Lesson two. Here are some differences between the Boxcar Base and magnetic bases. the surface of the base. The Boxcar Base is gridded with .25” lines, allowing for simple alignment of your plates to the base. When you put your plastic-backed plate down on the Boxcar Base, you’ll be able to see the base’s grid through the plate because these plates are transparent. This makes registration easier. Magnetic bases are not gridded, and steel-backed plates are not transparent—you’ll have to align your plates to your base with a line gauge and possibly registration marks. This works, but it is more time consuming and there’s more room for error. the hold of the plate on the base. After you press the plastic-backed plates onto your Boxcar Base, the plate moves only when you want it to. Our adhesive and plates pull up from the base easily when lifted vertically, but resist the horizontal shearing (the moving of side to side) of the rollers and press cylinder. The Boxcar Base’s film adhesive resists shearing more than the magnet does on magnetic bases. Even with an ultra-strong hold, infinitely small registration adjustments are possible because of the Boxcar Base’s high-tech adhesive. The Boxcar Base is also guaranteed to hold your plates in register. The magnets in magnetic bases hold a plate from peeling but cannot always hold a plate from moving side to side. The cylinder or rollers of a press can move steel-backed plates out of register during a press run (that’s “plate creep”). Printers who use bases with surface magnets (like the Patmag) often resort to adhesive sprays or tapes to hold plates in register during print runs. The more expensive magnetic bases (with inlaid magnets) have such a strong hold that small adjustments of the plate position is pretty much impossible. the hardness of the base. The Boxcar Base is 100% aluminum. It contains no materials that will give under impression. This allows for a crisp deep impression. In magnetic bases with surface magnets, the magnet material is softer than aluminum. This softer material will give under pressure during a press run, adversely affecting the crispness and evenness of impression. Magnetic bases with inlaid magnets are like the Boxcar Base, they contain no materials that will give under pressure. The Boxcar Base is guaranteed to work for you. If you’re having a problem or unhappy, contact us and we’ll work things out. We also provide life-long technical and printing help to our base customers. Just call, email, or chat if you’re having trouble on press and we’ll help you out. Ask your magnetic base supplier about the technical help and guarantees they offer so you can compare things yourself. The Boxcar Base’s plastic-backed plates are flexible, transparent, can be cut with scissors, and allow for accurate registration when mounted on our gridded base. 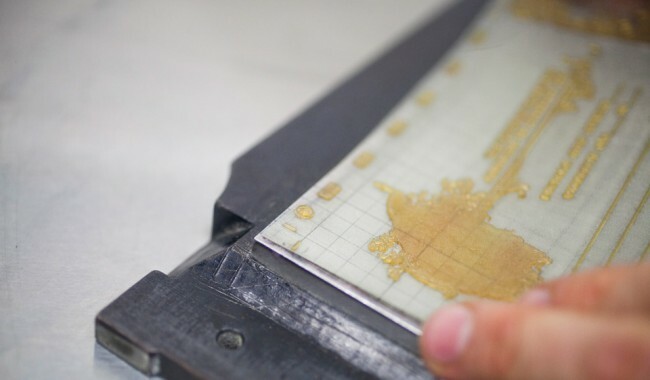 If you keep your adhesive clean, you’ll be able to reuse it when reprinting your plate. Plastic-backed plates are less expensive than steel-backed plates. Magnetic bases use metal-backed plates, which require a board sheer to cut (tin snips as a back up). The plates aren’t transparent. Minute adjustment of magnetic plates can be difficult to make since the magnetic plates snap quickly down onto the magnetic bases. Steel-backed plates are more expensive than plastic-backed plates. Read more about the differences between plastic-backed and steel-backed polymer plates. 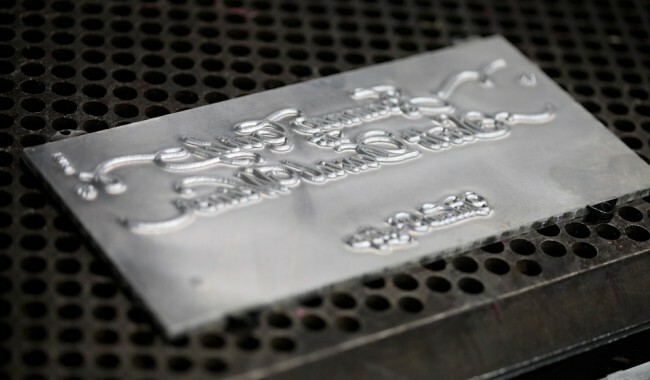 When mounted on their appropriate bases, plastic-backed and steel-backed photopolymer plates both create type-high surfaces for letterpress printing. Both plate types are recyclable. But we’ll talk about some of their differences below. can be cut with scissors in both their unexposed and exposed forms. are transparent, meaning you can see the Boxcar Base’s grid through your plate. This allows for simple alignment of your plates to your base: For perfect registration, align a certain element of your plate to the grid: take a horizontal or vertical element in your plate (this could be your registration marks, or a horizontal line in your artwork) and line it up to the grid. allow printers to print two color jobs using one plate if the design elements don’t touch. Cut out the second color images/text with a craft knife or scissors and set aside. Print color #1. Set your second color images back in place and pull up the first plate for color #1—perfect registration! allow designs to be ganged up on plates closely to save space (and money). are reusable. You should be able to reuse the adhesive on the plate too if you keep it clean and cover it with a silicone sheet. more prone to curling, especially with large solid areas over time. If purchasing unexposed plastic-backed polymer plates, you’ll also want to purchase film adhesive to adhere your plates to your base. If we’re making your plates for you, we include adhesive. Over here at Boxcar, we use plastic-backed plates for all our printing (the KF95 plate paired with the Standard Boxcar Base). require cutting with a metal shear or heavy-duty trimmer. You can use tin snips, though you may end up with kinks in your plate, as tin snips won’t cut as cleanly. sometimes shift and creep on your base during printing. Magnets in the base effectively hold a plate from peeling but cannot always hold a plate from moving side to side. The cylinder or rollers of a press can move steel-backed plates out of register (that’s “plate creep”). are not transparent. Because magnetic bases aren’t gridded (and you can’t see through these plates), you’ll have to align your plates to your base with a line gauge and possibly registration marks. This works, but it is more time consuming and there’s more room for error. are rigid, meaning they don’t bend well. This inflexibility can cause plates to kink and warp when handled so that their corners may work up while on press. Steel-backed plates are, however, very durable and not prone to curling over time. are more expensive than plastic-backed plates. are difficult to get on and off the base, especially when the base has inlaid magnets. When placing metal plates on a magnetic base, keep fingers clear so they don’t get pinched when the magnet grabs. When taking your plate off the base, try an ink knife to pry under the plates to release from the magnetic base. have sharp edges, which dictate extra care when handling. can be used for a wide range of printing and impression—on leather, metal clay jewelry, ultra heavy-weight paper stocks. 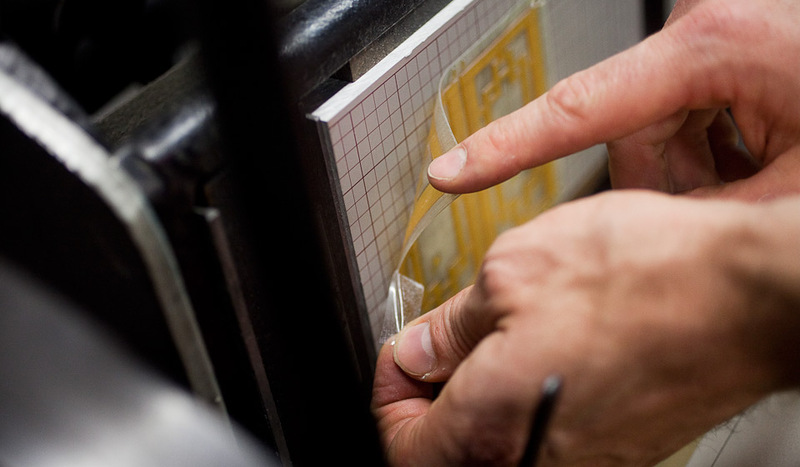 Steel-backed plates can also be used on etching presses when relief printing is desired. They are not suitable for high temperatures of foil stamping though. Lesson three. Short and sweet. Try things out yourself — get your hands on a free polymer plate sample.